The VISIBLE fountain pen! Educational! Hours of fun! In a very broad sense, almost everything we think of as a pen today is technically a “fountain” pen, in that the term came about to differentiate a pen with an internal ink supply from dip pens. However, with the development of various different sorts of pens, the words “fountain pen” have come to mean a fairly specific sort of creature: a pen using liquid ink brought from an on-board reservoir and delivered to the writing surface using capillary action in a solid metal point. Which is, frankly, something of a mouthful. Apart from some technical terms which are illuminated in the Science department, the best way to define a fountain pen is to compare it to other writing instruments. Starting with the obvious, a fountain pen is not a pencil, as the latter works by giving up a solid marking material through abrasion against the paper. Solids have no place in fountain pens. The pens most in use in the modern world are ball-points and rollerballs, both of which have a little bearing forced into their tip which transfers the ink from much the same way as a deodorant roller. While ball-points are full of a sticky goop that is closer to the ink used in newspapers than anything else, rollerballs may use a fluid ink like fountain pens. A quick look at the front end, though, shows up the difference. Dip pens and fountain pens share a commonality, in that the point is made of metal and conducts ink along a slit. 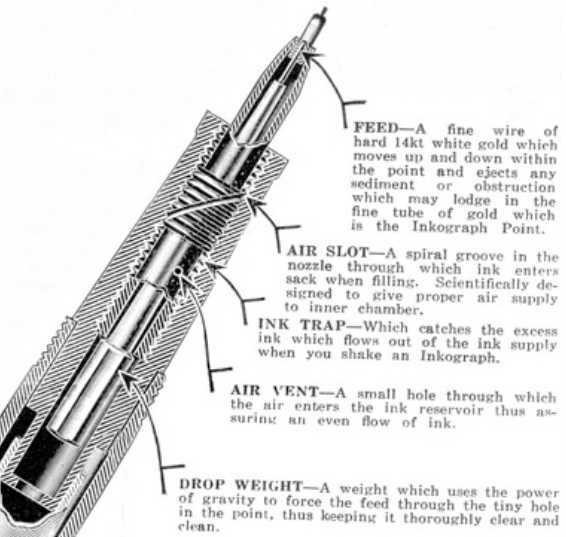 However, that’s about it; as I said earlier, the fountain pen got its name because it stores its own ink supply. There are a lot of people today who will get the two confused, but the difference is usually pretty clear: if it’s just a bit of metal and a stick, it’s not a fountain pen. There is also a commonality between markers and fountain pens, although it is rather less obvious. Both rely upon capillary action to get the ink from their interior to the paper, although the fountain pen has only one channel while the marker’s fibre tip has thousands. Unlike the fountain pen, the business end of a marker is relatively soft, and it will degrade rather more easily in a long bout of writing. One final sort of writing instrument many people will not have seen, it having slipped into specialized use. The stylograph, which now mainly appears in the hands of graphic artists and a diminishing number of architects, is very like a fountain pen in all but one aspect– the point. In stylographs, ink flows down a narrow tube, restrained by the tube resting against paper when in use and by an extremely fine wire with a stopper at the upper end when the point is lifted. This little wire and the difficulties of maintenance it engenders are why more stylographs aren’t seen in use; the technology predates the appearance of the fountain pen, with patents starting in the 1870s. More finicky than fountain pens, they do have the advantage of producing extremely regular lines. Fountain pens have been around since the late 1800s. There are not many things in use today that were in use then, and this draws the question; they’re old technology, tend to cost more than $1, and aren’t in stores everywhere, so why make the effort to get one? That is, of course, a rhetorical question, and as the guy who posed it, I have what I think is a pretty solid answer laid out.